Remember that exciting feeling of going school supply shopping, as a kid? 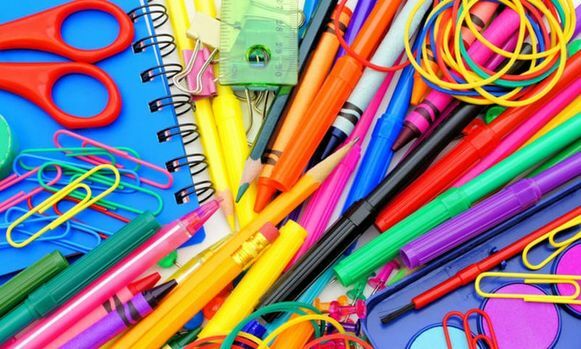 Eagerly walking up and down the store aisles with a parent, lists in hand, choosing new pencils and pens, picking out just the right colored notebooks and folders, the thrill of seeing the shopping cart slowly fill up with everything you needed? There was nothing like it. And though the summer was ending, it helped make the first day of school something to look forward to. The self conscious feeling of arriving on the first day, watching as their peers unload brand new backpacks full of crisp, clean notebooks and colorful markers while they unpack hand-me-down school supplies from a worn bag. Out comes an older sibling’s discarded, tattered notebook with a few blank pages inside. A blunt pencil or two with missing erasers. A binder with the previous owner’s name rubbed out. Or the embarrassed feeling as they come to school with no supplies. It may sound extreme but this is the reality for thousands of kids in Israel whose parents are really struggling-to pay the rent, the electric bill or put food on the table. Plus with the expenses of the High Holidays right around the corner, there’s certainly no money for new school supplies. That’s why this year, we too are excited about school supply shopping because with your support we’ll be able to help provide brand new ones to kids who really need them. Partnering with the Chanan stationery and office supply chain, we have purchased gift cards at a 15% discount, which will be distributed to needy families. This will enable their children to experience the pride of shopping for new school items and more importantly, come ready for their first day outfitted with their necessities, empowering them to sit in class and learn with dignity, just like everyone else. You can be a vital part of this meaningful opportunity. Please help us make this back-to-school season a memorable one, for so many children in need.